Is it possible to have a radio button within a matrix? I'm asking for a bunch of info. Some of which is simply yes or no. Can I put in a two option radio button to clean things up and save space? As luck would have it, the user would be presented with the same choices you want to have: "Yes" and "No". Plus, since each dropdown would only show a single choice at a time, they would occupy less space than two radio buttons. Also, since there would only be two choices, check boxes would be another viable alternative. Each can either be checked to indicate a "Yes" or left not checked to indicate "No". 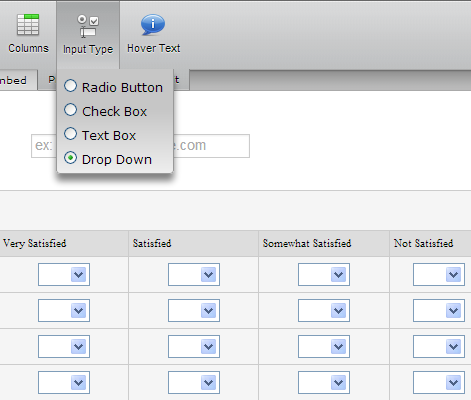 However, unlike drop down and radio button fields, a check box can only have two states (they're either checked or they aren't) and as such, this alternative would only be practical if all of the matrix's cells must be "answered" (for want of a better term). If you need clarification on anything, please let us know. Ah, sorry, I wasn't clear. I need most of the matrix fields to be text, but a few to be either radio or drop down. To help clarify, here is an image of one of the matrices as it stands now. 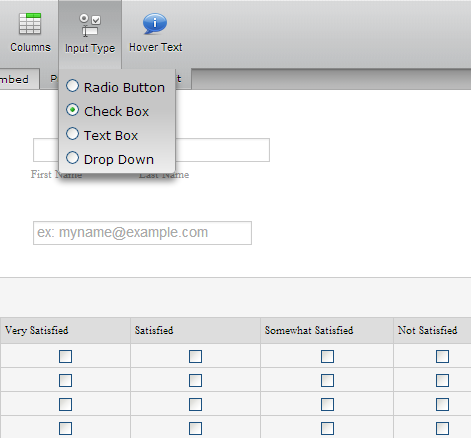 For column two, I want a radio or drop down, but the rest should be text fields. Oh. In that case the source code route, to which I earlier referred, is the only way to go since matrices can't currently be adjusted in that manner via the form builder. Therefore, the copy of the form's source obtained from the Embed Form Wizard would have to be altered. I can have that code for you either later today or sometime tomorrow if you're okay with using the source code method. Ah ok... Well for now it's ok. If I need to make that change in the future, I'll post here again.